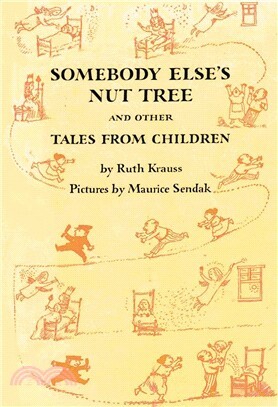 First published in 1958, Somebody Else’s Nut Tree and Other Tales from Children is now back in print! From beloved children’s book creators Ruth Krauss and Maurice Sendak comes this classic picture book told in a series of poems that perfectly capture the realm of childhood with humor, truth, and beauty. Once again Ruth Krauss and Maurice Sendak, well known for their collaboration on such books as A HOLE IS TO DIG, A VERY SPECIAL HOUSE, and I’ll BE YOU AND YOU BE ME, have captured the realm of childhood with humor, truth, and beauty. The stories in the book are, as the subtitle says, “tales from children.” Each had its beginning in words which Ruth Krauss heard said by a child. In complete harmony with the children’s own form of expression, Miss Krauss has reworked, complemented, and supplemented their ideas, adding to them her own magical knowledge of childhood. Maurice Sendak’s drawings have never been more delectable. Each love-filled page mirrors the essence of the engaging, unself-conscious words.